This article was included in the "Sheridan Celebrates" booklet from September 22, 2007. 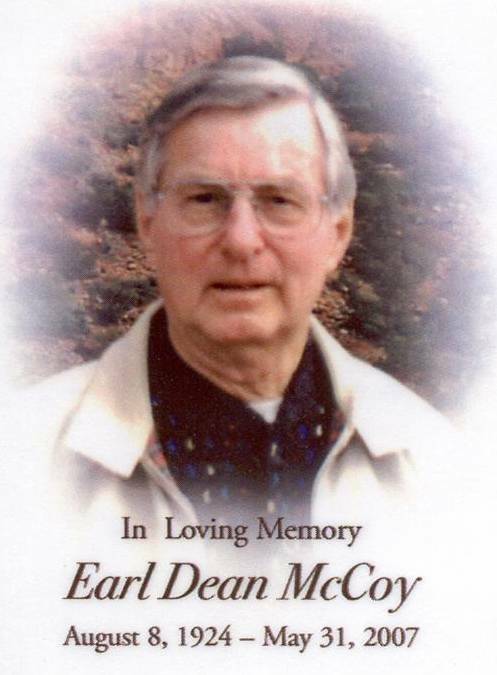 Earl McCoy was born in Mt. Sterling, Illinois, the son of a local newspaper printer. He had a twin sister who preceded him in death. Earl moved to Denver in 1959 as program director at the Auraria Community Center in a heavily Hispanic neighborhood. In 1962 he married Wanda DePizzol. They had two children, Eric, who preceded him death, and Anthony, He and Wanda were most interested in Southwest art and studied Spanish so they could interact effectively with the people they met. From 1968 to 1987 Earl was Fort Logan Mental Health Center's Assistant Chief and the Chief of the Community Service Department. He later also became Information Officer. Earl grew fascinated with the old army base recycled in 1960 as a state mental health center. After the army closed frontier military posts, this was the only garrisoned post in Colorado. The 988-acre grounds stretched roughly from Sheridan to Lowell and Quincy to Kenyon. This base housed the Dwight D. Eisenhower family, the Second Army Engineers, a CCC Camp, and the Reserve Officers Training Corps. Earl's extensive research led to the "From Infantry to Air Corp: History of Fort Logan," November-December 1986 Roundup; "Adventures of Ivy Baldwin, Aerialist," for the March-April 1993 Roundup; followed by "Judge Rucker and the Fort Logan Water Wars in the July-August 1999 Roundup. Earl founded the Friends of Historic Fort Logan in the fort's centennial year of 1987 and served as the first president of the group. As the historian of the fort, he prepared the successful Denver Landmark nomination of its Field Officers Quarters. To preserve that large Queen Anne residence at 3742 West Princeton Circle, Earl spearheaded the Friends effort to raise $140,000 in matching funds, grants and volunteer services to capture over $160,000 in matching funds scratched out from the State Historical Fund. It has been restored as a museum and educational center that includes the Denver Posse's archives. Earl was a member of the Denver Westerners since 1984 and the Posse since 1987 serving as archivist and Roundup Foreman (Secretary). Earl took the time to visit other houses on the Circle and traded doorknobs, hinges, window closures and locks, so the "House" would be as built. He was even able to obtain a marble sink from one house to use in the lower restroom. He excelled as a historian besides writing and researching history, and was always willing to assist with research and pictures for the Sheridan Historical Society, of which he was a founding member as well. We owe a great debt of gratitude for that generosity and his expertise over the years. He was an interested and knowledgeable voice in the annals of local history, and he always made it interesting and fun. Earl will be missed. With thanks to Tom Noel for material, which he presented as introduction prior to awarding Earl a Lifetime Achievement in the Denver Posse of the Westerners.